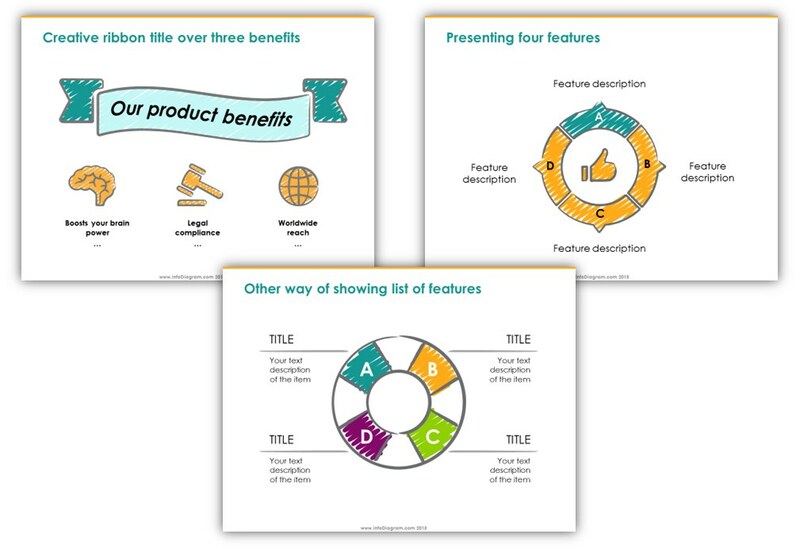 Looking for an answer how to be more creative and original while creating presentations? Check the following four tips. No doubt you want to make an outstanding presentation, which will catch all the attention of the audience. The trick is how to be different than the masses. Especially if you’re one of the several presenters. The question is how to step out of common default look of slides everybody is using? Find a moment before making a presentation, jump into your creative mood. How? We brainstormed for a list of suggestions on how to think outside the box. Works fine also for a busy workplace. 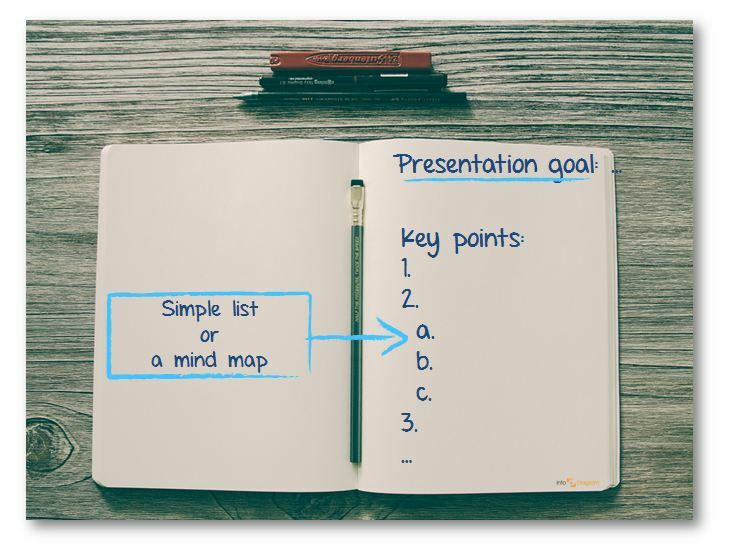 Start preparing a presentation on a blank paper, not in your PowerPoint, Keynote, Prezi or whatever presentation software are you using. 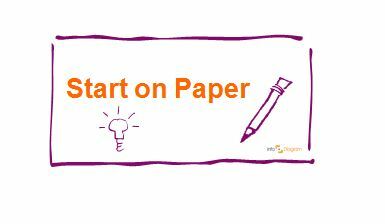 Firstly sketch down your presentation main message, draft a structure. 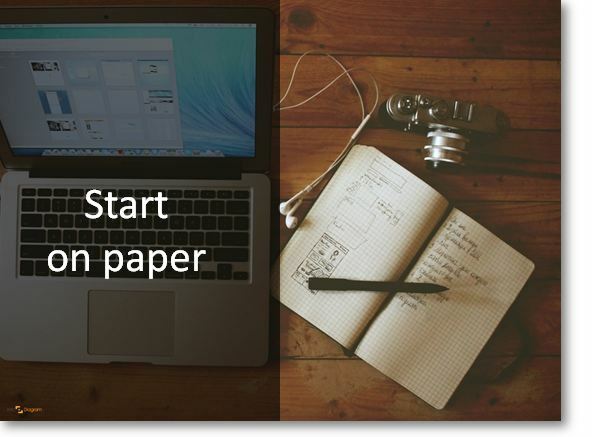 Our brains are much more creative with paper than using a software at the start (here’s our blog article about it: Tricks to Get Creative With Presentations Preparation). After having an idea on paper how to show your idea on a slide, you can go to a computer. But stick close to your paper notes. Avoid adding too many elements inside. Overcrowded slides are not a symbol of creativity. Well, unless you create mosaics graphics out of it ;). Stay inspired – look for inspirations of interesting looking presentations in places such as TED.com talks or Slideshare.net platform, especially the featured presentations selected by their editors. There are many people, from whom you can get ideas and new fresh view on your work. 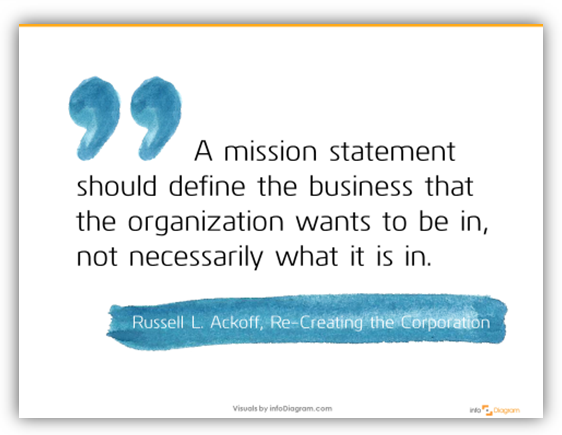 You can check also our Slideshare channel for some inspirations. Try to do this on regular basis, not only before your talk, when you usually don’t have much time. Schedule e.g. watching one TED talk a week. BECOME AN EXPLAINER: The most creative people in any field are people who have a tremendous amount of knowledge. Creative people like Einstein, Edison, Coltrane, and O’Keefe were also experts in their own field. In this age of Google, there is a tendency to assume that information is available when you need it and so you don’t need to internalize it. PRACTICE OPENNESS: One of the five core personality dimensions is openness. It reflects how much you are motivated to consider new ideas, concepts, and experiences.If you are someone who resists new ideas and experiences, that does not mean you cannot be creative, you need to develop a new set of habits to try new ideas. KEEP ASKING NEW QUESTIONS: A third critical aspect of creativity is to remember that any idea you have is something that you pulled out of your memory. That means that when you have a brilliant idea, you retrieved a helpful piece of information from memory and used it. Read more about those three tips in the article How to Train Yourself To Be more Creative by Art Markman. Looking for more ideas? Get a Creative slide design guide with free hand drawn shapes and sign up for our newsletter with regular inspirations sharing.